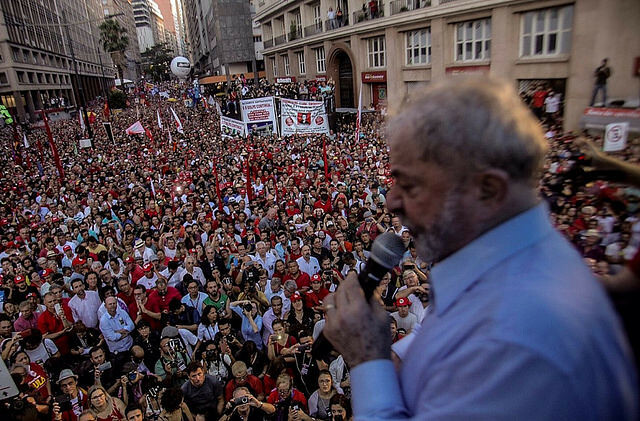 Former President Lula da Silva delivered a passionate speech on Tuesday night in front of thousands of his supporters leading up to his court hearing on Wednesday. “Regardless of the outcome, I will continue to fight for people’s right to respect and dignity,” said former president Lula da Silva in his speech leading up to the court ruling. Brazilian popular movements and civil society groups are staging mobilizations in at least 18 different states across the country on Wednesday in defense of their former President. Organizers of Wednesday’s political protests estimate around 70,000 people have gathered outside the courthouse in the Southern city of Porto Alegre, where Lula’s trial is taking place. Several high-profile artists, intellectuals and public officials attended Tuesday’s rally including member of the national coordination of the Landless Workers Movement (MST) João Pedro Stedile, President of the Brazilian Workers Party (PT) Gleisi Hoffmann, singer Chico César and former president Dilma Rousseff. “Throughout the trial against Lula, the opposition has showed their true colors. They are enemies of the Brazilian people. However, we are hopeful that this appeals courts will recognize the need for justice rather than political persecution,” Rousseff stated. Read this news in Portuguese and in Spanish.